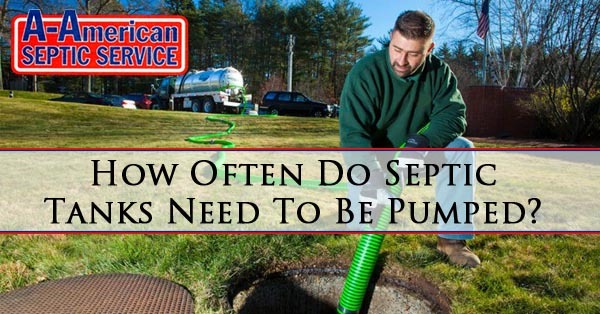 How Often Do Septic Tanks Need To Be Pumped? In the city there are usually community waste disposal and sewer systems. This means that homeowners rarely have to think about how their wastewater is disposed of. Houses that are not part of a community sewage system need to be more proactive in caring for their wastewater disposal. If the septic system isn’t maintained properly the result can be a poisoned leech field or worse the pipes backing up into toilets, showers, or bathtubs. If maintenance is left until there has been a problem the repairs can be expensive and the soil and water table near the septic system can become contaminated. Yearly tank inspection and regular tank pumping is the way to avoid these potentially expensive and hazardous conditions. While many government agencies recommend pumping at least every 3 to 5 years your septic system and usage might require more frequent pumping. Some factors that contribute to more often pumping of your septic system are if you use a garbage disposal, the size of your septic tank, and how many people are living in the home full time. Every drain in a home that has a septic tank typically drains straight into the septic system. This means the washing machine, sinks, toilets and tubs are all putting a load on your septic system. Once the wastewater has made its way into the tank the heavier particulates sink and the proteins and oil float to the surface as scum. This leaves a section of water between the scum and the sludge at the bottom called the effluent water. This is the water which is released into the leech field. Then the gravel and soil filters the water and the remaining organic matter fertilizes your yard. With every drain going into your septic system plastic, grit, sand and other inorganic matter invariably ends up in the septic system and the bacteria that reduce the organic material can not break it down. The only way these materials can be removed from your septic system is septic tank pumping. It goes without saying that the more you put in, the more often it will need to be pumped out. The factors that influence how often you will need septic tank pumping are the number of people in the household, if you use your garbage disposal, and the size of your septic tank. If a family of 4 has a 1,500 gallon tank the scheduled pumping frequency is about 4 years. If that same family uses their garbage disposal it increases the amount of solid waste the septic system is coping with and the pumping will end up being about every 2 years. With more or less people, or the presence of a garbage disposal the frequency you will have to have septic service will vary. Homeowners can keep a log of the amount of sludge removed and start to plan accordingly on when they will need to have service again. A-American Septic Service has the tools, training, and full understanding of how septic systems function in Arizona. If you need service simply call us at 602-254-5448 and we will help by answering questions, scheduling septic tank pumping, or help you with emergency septic system issues. We know that it can be a dirty job and are here to help you get through it. © Copyright 2003 - 2019 A-American Septic Service. Designed & Created by WebTechs.Net | Arizona Web Design & SEO. All rights reserved.